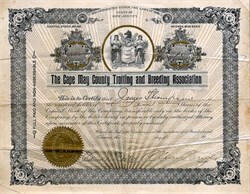 Beautiful certificate from the Cape May County Trotting & Breeding Association incorporated in 1907. 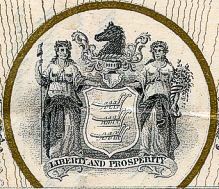 This historic document was printed by the Broun - Green Company and has an ornate border around it with a vignette of two allegorical women sitting with a shield in between them and a horse's head above it. This item has the signatures of the Company�s President, C. Oliver Bright and Secretary, Ediom D. Foster.